Ok, I know in the last post I mentioned that I couldn't start a new project until I finished at least 3 projects that I had OTN. Well, this project was started the second I had finished my Lintilla shawlette. I really couldn't wait any longer and had decided then and there to immediately cast on a new project with another skein of Wollmeise. I really want to find out if I do like knitting with and wearing Wollmeise before I "invested" any more money on this yarn, cause if I find out that Wollmeise and I do not mix...well, I would need to find new homes for the 60+ skeins that I have in my stash! Eee...just saying out loud just how many skeins I have kinda alarms me...maybe I should think about wrangling my yarn stash?? 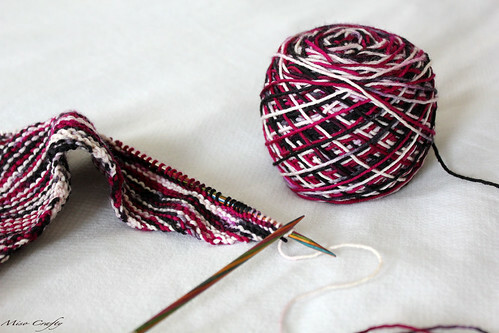 Anyhoo, I'm knitting up another Martina Behm design. This time around I'm knitting her Trillian shawlette. 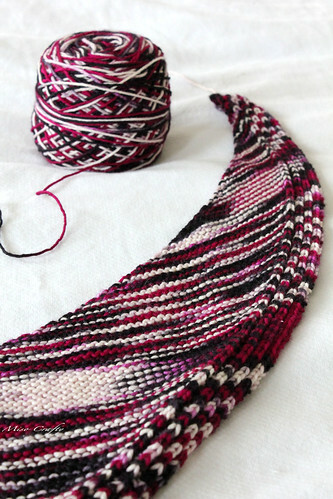 Just like Lintilla, this pattern is super duper easy and totally memorizable. The only issue I've had so far is my tension on the fishnet lace border on the first half at the beginning. I know I was pulling the yarn tight which makes the lace not so lace-y. It kinda bugs me but there is no way I'm ripping back to the very beginning just to fix that! I'm going to have to be super aggressive while blocking this part and hope that it'll open up more. In the meantime I've been keeping a conscious eye on the rest of the fishnet border and making sure that I'm knitting it loosely enough to be considered lace. Since I had made Lintilla in Wollmeise 100% Merino, I decided I would give the Twin a try. So far I haven't notice much of a difference weight-wise, but the Twin is definitely less splitty and I've only had a few issues with single plies being tugged out by my sandpaper dry hands. I'm using my coveted (by me...for what seemed like forever!) skein of Skandal um rosi, which is absolutely gorgeous in skein form. Now that I'm knitting it up though I can't say if I'm 100% in love. I think it's the stark white parts. To me they really stand out against the black and dark fuchsia. This piece is definitely a stand out piece and is something that is going to have to be worn with a subdued outfit. Just like Lintilla I'm a bit surprised as to how long it's taking me to knit this up. Mind you I haven't been giving it my full attention. So far I've only been knitting on it whilst at work. On a break. And even then I only get a row knit up here and there. I do have the best intentions for working on it though. I do bring it with me wherever I go in hopes that I'll be able to work on it some more. But I will admit that I just don't feel the pressure to finish it since I'm not counting it as one of my 12 in 2011 projects (the yarn was purchased this year), and I still have another shawlette OTN - which I feel extremely guilty about, as it's almost finished but I can't seem to bring myself to work on. Ugh. Now that I think about it, I have quite a lot OTN that I should just force myself to finish. Hmm...maybe that should be the theme for the rest of the summer? Well, while I think about this idea I should really get cracking and finish up a cardigan or something. 'Til next time, happy knitting blogging Friends!